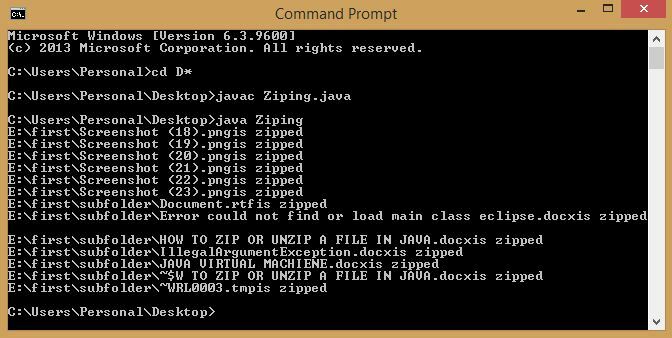 Here we will learn about how to zip and unzip files and folders in java. If information contains redundant data it will be tough to store and transfer the data. So we will go for compression which will give efficient representation of the data. For zipping many algorithms are there. 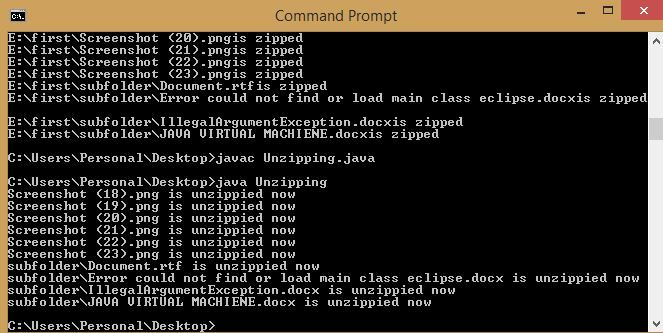 Java provides the java.util.zip package for zipping and unzipping the files. The class ZipOutputStream will be useful for compressing. It is an output stream filter which will write files to any File output stream in zip format. The class ZipInputStream will be useful for decompressing. It is an input stream which will read files that are in zip format. How to Zip Files in Java? For zipping purpose we have many algorithms. If we are not mentioning any alogorithm through any method it will use default compression method that is DEFLATED compression. Deflated compression is almost near to Huffman coding. Now we will see one example. Problem: We want to zip the directory which has multiple files along with sub folders. Solution: Zipping a file is very easy. But when we are zipping a folder which contains sub folders we should take care about the relative paths of files which have to be zipped. For example take directory named as first which is located in E disk. It contains one subfolder along with multiple files. We have to zip it now. Step 1: We should list out all files in the directory. listFiles() method will return total files (directories + files) in that directory. We can use this method to list out the total files. For this we have to check whether it is a directory or not. If it is a directory then again list out the files in that subdirectory. Continue this process until all files are listed out. This is recursive process. Step 2: After listing out the files, we should create a file output stream for output zip folder. So that it will create output zip folder and write the contents to it. Step 3: We should create a zip output stream which will write file contents to the file output stream in the format of zip. Step 4: Now we have to zip each file in list according to their paths. Create an input stream for a file. So that it can read file contents. Create a zip Entry object for file with relative path only because if use absolute path it can’t find files so zipping is not possible. So that we can add this file to zip out stream. For adding putNextEntry() method of ZipOutputStream will be useful. Now zip output stream will write these file contents in the format of zip to the file output stream. This is the process of zipping one file. So do the same for every file in the list. Step 5: As zipping of all files is done. Now close all IO streams. Proper closing of IO streams will prevent the corruption of zip files. //create a new zip file in which all input files have to be zipped. //create output stream for the zipfile. //create zipoutputstream for the outputstream. //for zipping purpose we need only relative path. we shouldn't consider absolute path. //this will give relative path of the file which we are zipping now. //we should create zipentry for each file. //if it is a file then add it's absolute path to the list. How to Unzip Files in Java? Unzipping file means expanding the compressed information to make file as like its original form means before compression. For that ZipInputStream class will be useful. Suppose we want to decompress the zip folder named as first.zip which is located in E disk. Step 1: We should create file output stream for output folder. So that it can write files to that output folder. If output folder is not exists then create output folder. Use mkdirs() method. If any parent directories are not there then it will create them also. Step 2: Here we have only one file that is zip file. So create one file input stream this is enough. This will read contents from zip file. Step 3: Now create Zip input stream for this file input stream. This zip input stream can understand the zip file contents. It will change zip form to normal form. Now these file contents has to be written to individual files. We should know which files are present in that zip file. So getNextEntry() method will return file which is present in zip file. We should check the return value of the above method. Because if we are trying to unzip the corrupted zip file, it won’t be possible and if it is corrupted zip file then the above method will return the null value. If it returns file value then we have to create file output steam with the relative path of that zippied file entry. So that we can unzip the file contents folder wise. Without disturbing the file organization. This file output stream will create the file and write the contents to that file. Use getParent().mkdirs() method to create parent folders of the output file. Now write the file contents to the output stream so that it will write to file. This is one file unzipping process. Repeat this process until all zipped files are unzipped. Now we will see the program that will unzip the file contents. //zipinputstream will be useful for reading zipped contents. //each file in zip file we can get by getNextEntry() method. //we can't extract that corrupted files. //files should be unzipped according their paths only. //if any parent files are not present then we should create them also. //we should close io streams. Comment below if you have any queries or found any information incorrect in above tutorial for zip and unzip files in Java. What is HashCode in Java?